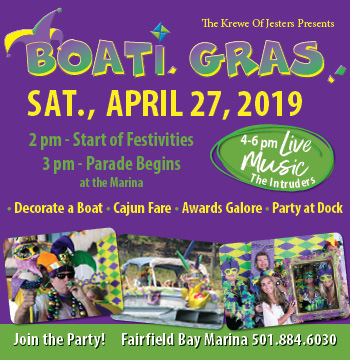 Boati Gras: festivities, boat parade, food and live music at the Fairfield Bay Marina, April 27 from 2 pm – 9 pm. Call 501-884-6030 for more information. Stand with a Cop Parking Lot Sale, Saturday, April 27, 8 am – 3 pm, Sisters Emporium parking lot in Clinton, Call 501-253-4716 for more information. Twilight Golf at Indian Hills Golf Resort, April 28th beginning at 3:30 pm. Call 501-884-6018 for more information. El Pablano 5-year Fiesta, Saturday, May 4, from 4 pm – 9 pm. Live music from 4 pm – 7 pm. 373 Dave Creek Parkway in Fairfield Bay, 501-884-4200. The Dirty Farmers Community Market and Great Good Retreat Six-year reunion Celebration. Sunday, May 5th at the Petite Jean Building in Clinton, 2 pm – 5 pm. This is a free potluck event and open to the public. Call 501-253-4716 for more information. 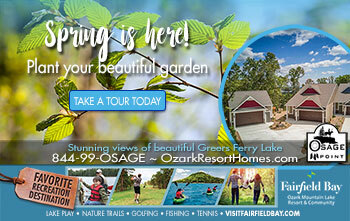 Three Rivers Group Golf, Indian Hills Golf Resort in Fairfield Bay, May 6 beginning at 10 am. Call 501-884-6018. Bloomin’ in the Bay, Blues and BBQ and Cruzin’ the Bay Classic Car show, three events in one! 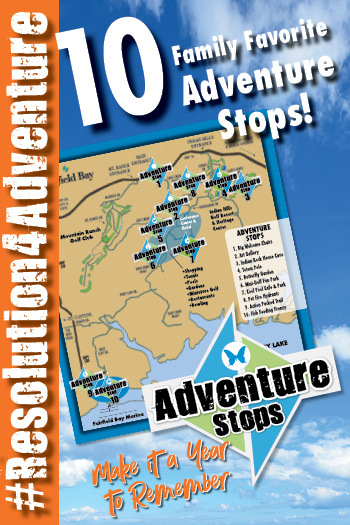 Saturday, May 11, 9 am – 4 pm, Dave Creek Parkway in Fairfield Bay. Fairfield Bay Senior Center Rummage and Bake Sale, Senior Center May 11, 8 am – 2 pm. Our Towne Productions presents the comedy show, Blithe Spirit at the Conference Center in Fairfield Bay beginning May 16 – 18 at 7 pm and May 19 at 2 pm. Call 501-884-4202 for more information. Fun in the Sun, May 25th, 9 am – 8 pm. All day pool party at the Cool Pool in Fairfield Bay, 155 Chelsea Drive. Call 501-884-6009 for more information. Gold Star Memorial Fund Golf, Indian Hills Golf Resort in Fairfield Bay, May 25th beginning at 9 am. Call 501-884-6018 for more information. The Fairfield Bay Adult Education Center offers weekly painting classes. Call 501-884-4440 for more information. The Fairfield Bay Rotary meets every Wednesday at 11:30, Little Red Restaurant, Fireside Room. Fairfield Bay Senior Center Line Dancing, every Monday, 6:00 p.m. at the Senior Center. VFW Post 4513 Bingo nights every Monday in Shirley, 6:30 p.m. and every Wednesday and Friday night beginning at 7:00 p.m. is Karaoke nights.Encore at the Conference Center is open every Tuesday. First Tuesdays from 5-8 p.m. are Game Night, Second Tuesdays from 6-8 p.m. are Music with Greg and Friends, Third Tuesdays from 5-8 Wine’d Down nights and the Fourth Tuesdays is Relax and Unwind Soft Piano with Alan. Call the Conference Center for more information, 501-884-4202.